After 40 years of keeping families in the Ottawa area safe and comfortable in their homes, we’ve come to appreciate the importance of our environment—both indoor and outdoor. If, like us, your interest is in heating and cooling your home in the most efficient, eco-friendly way possible, we have the solutions. 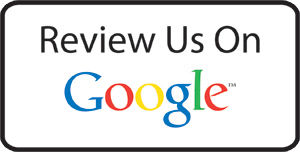 Why not make an appointment today to talk to one of our fully certified home-comfort technicians? Call 613-739-4515 and we will be glad to talk to you about alternative ways of keeping your home warm in the winter and cool in the summer with as little environmental impact as possible. Bryant Hybrid Heat™ Systems combine the strengths of two heating sources to deliver the warmth and efficiency you deserve this heating season. Yet it also cools your home in the summer and there’s money savings potential there as well. The Hybrid Heat system is so efficient, the cost to heat with it is less than with any gas furnace alone – even a 100% AFUE furnace! Because Hybrid Heat provides the flexibility to react to changing energy costs, it’s an excellent investment for long term peace of mind, comfort, and protection against unpredictable fuel cost increases. Hybrid Heat Systems deliver exceptional performance using a heating source that provides its most energy-efficient comfort during moderate heating conditions. As the temperature drops outside, the system automatically switches to your second heating source when that becomes the most economical way to keep your family comfortable during more extreme outdoor conditions. Just as you would with any typical heating system, simply set your desired comfort level, and let Bryant’s Hybrid Heat do the rest. 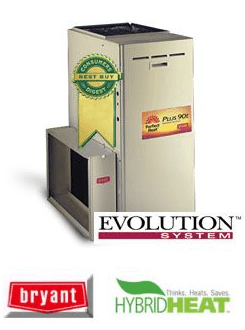 Bryant’s ultimate Hybrid Heat System combines the Plus 90i gas furnace with one of our Evolution series heat pumps to provide soothing, superior comfort during both heat pump and furnace operation. This powerful combination can deliver heated air temperatures that are warmer than most traditional heat pumps so air from your vents feels warmer to the touch. Because a heat pump also provides cool, indoor comfort when it’s hot outside, a Bryant Hybrid Heat system becomes your total, year-round indoor comfort solution. 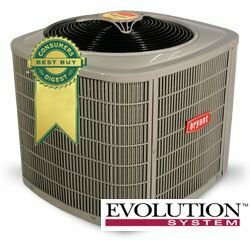 And with the recent increase in efficiency of air conditioners and heat pumps from 10 to 13 SEER (Seasonal Energy Efficiency Ratio), a Hybrid Heat system could save you money during the cooling season.